Mickey and Donald: The Persistence of Mickey – The lead story in this volume is based on the real-life collaboration between Walt Disney and Salvador Dali. They worked on an animated short called Destino, but due to cost issues, all that resulted were an animation test and a confusing storyboard. While working on Fantasia 2000, Walt’s nephew Roy hired people to finish the short. It’s apparently about the ill-fated love of the personification of time for a mortal woman named Dahlia, and includes a lot of melting and morphing, and references to themes Dali used pretty often. 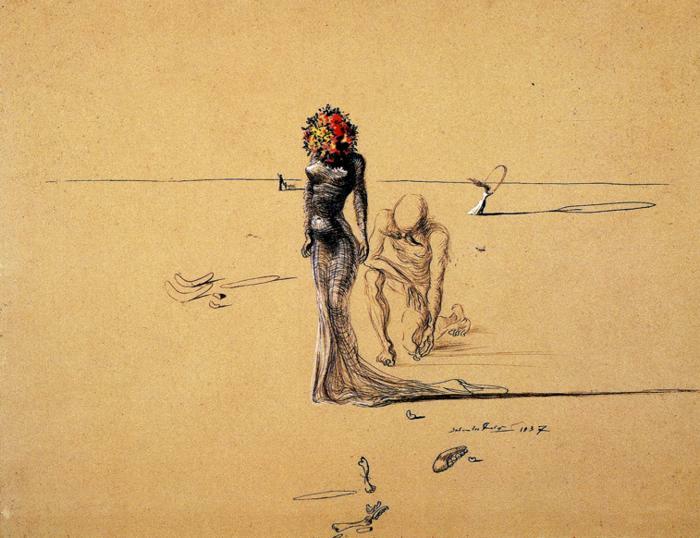 I had a poster of an unfinished Dali painting of a girl with a flower head when I was in college. I guess I had pretty typical college kid tastes, as I also had some M.C. Escher. The thing is, I had these same tastes before and after college as well. I became interested in Alphonse Mucha because I came across some of his pictures in the school store. The theme of separation by time has only become more appropriate with the gap of over fifty years before the cartoon was finished. Anyway, the original release of the short was in 2003, but the comic was made to coincide with the release of the Blu-ray in Italy. It proposes a more fantastic explanation for why the short wasn’t finished back in 1946: that Donald Duck tried to take a stack of drawings from Goofy right when Dali’s plane was taking off, resulting in most of the pages blowing away. The three cartoon stars are presented as animated actors who work for Walt, and he and Dali are both human, yet there’s a dogface airline stewardess at Lockheed Air Terminal. Most of the story consists of the triad, along with Pete, who’s working as a studio security guard, being sucked into Dali’s paintings and interacting with some of his most famous creations, including melting clocks, the New World and Narcissus eggs, long-legged elephants, the lobster telephone, the lip couch, and the tigers from the pomegranate. There’s a nod to the story taking place in the past in the design of the characters, although it’s really TOO much of a throwback for the time period, as Mickey having all-black eyes and Donald the more squat appearance with the long bill were both phased out in the thirties. There’s another nod to the time period with Donald saying he needed to see his uncle on a mountain in fourteen months, as the Carl Barks classic “Christmas on Bear Mountain” was published in 1947. I don’t know whether this joke was in the Italian or added as part of the translation. Some of the other stories in this collected volume continue the theme of characters trapped in an alternate world, with Donald accidentally taking a virtual reality chip from Gyro Gearloose and Mickey and Goofy ending up inside a comic book with rogue text boxes. As might be expected, the latter is quite meta-referential. There are also two tales of Donald in food-related competition with Argus McSwine, who owns the Duckburg equivalent of Five Guys. 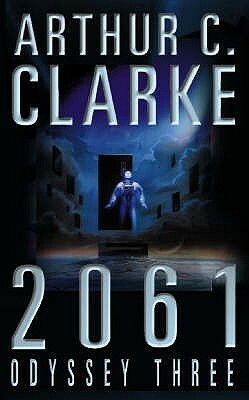 2061: Odyssey Three, by Arthur C. Clarke – It took me a while to finish this one. That’s mostly due to the fact that I usually switch between books at a certain number of chapters, and the chapters in this are very short. The year was chosen as that is when Halley’s Comet will again be visible from Earth, and part of the story is concerned with a crew landing on the comet itself. As the book was written before the fall of apartheid, Clarke predicts a revolution in South Africa that results in much of the white population leaving the country, and the resulting politics play a role. Most of it, however, deals with the exploration of Jupiter’s moon Europa. Heywood Floyd, now 103 years old, reappears as a major character, and ends up reuniting with Dave Bowman in energy form. Overall, though, the plot seemed a bit disjointed. There’s a stewardess who tries to hijack the ship, but we never learn her motivations, and her name isn’t even consistent. While it had some interesting ideas, it’s my least favorite of the series so far. I’ll have to see if 3001 is an improvement. This entry was posted in Art, Book Reviews, Cartoons, Comics, Revisiting Disney, VoVat Goes to the Movies and tagged 2061 odyssey three, andrea castellan, argus mcswine, arthur c. clarke, donald duck, europa, giorgio cavazzano, goofy, gyro gearloose, halley's comet, joe torcivia, jupiter, mickey mouse, pete, robert gagnor, salvador dali, surrealism, the persistence of mickey, walt disney. Bookmark the permalink.